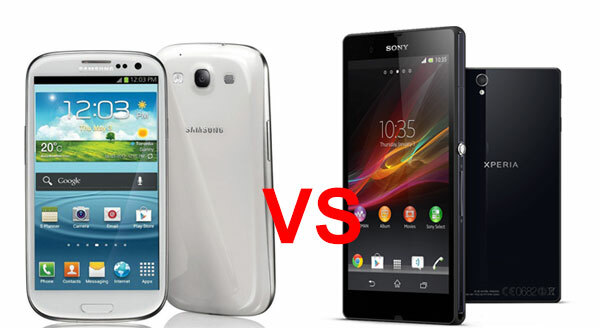 Galaxy S3 VS Xperia Z Comparison, Who is Better? Sony outed its top smartphones for 2013 at the CES expo in January. And the Sony Xperia Z sits right up top, doing battle with the Samsung Galaxy S3 and iPhone 5. But is does it have a chance at smartphone supremacy this year? Hardware design is one of the Sony Xperia Z’s strongest features. It has a waterproof body, certified to IP57. That means it’s almoat completely water and dust resistant. It manages this without any of the bulk of a ruggedised phone too. It’s just 7.9mm thick, and as both front and back are smooth plates of glass, it feels much harder and higher-end than the Samsung Galaxy S3. The Samsung is rather more ordinary-feeling. It’s a plastic-bodied phone, with a slimline removable battery cover. Dunk it in water and it’ll most likely die. The Sony Xperia Z – in theory at least – won’t. We’ll give it the dunk test when we get ours in to review. There is a clear generational shift in screen tech between the Sony Xperia Z and the Samsung Galaxy S3. As long as you don’t mind a slightly larger display, the Sony is much better. The Sony Xperia Z uses a 5-inch 1080p-resolution LCD screen, the Samsung Galaxy S3 a 4.8-inch 720p AMOLED screen. There’s a noticeable difference in clarity too, as the Samsung has a PenTile sub-pixel array, which reduces sharpness. AMOLED wins of a few fronts, though. In dark areas, the contrast of the Samsung Galaxy S3 will be noticeably better in dark environments – anything with a universal backlight can’t match up with an OLED screen. Much like the screen tech, the months’ head start the Samsung Galaxy S3 has on the Sony Xperia Z really shows. Both phones use quad-core processors, but the Krait 1.5GHz model of the Xperia Z outperforms the Exynos 4412 of the Samsung. It’s not an embarrassing loss for the Samsung, with around a 10 per cent benefit in benchmark scores, but it once again marks the Galaxy S3 out as a phone of last year. The RAM amount tells a similar story – 1GB for the Samsung, 2GB for the Sony. Other specs are closer, though. Both phones offer the geek-favourite microSD card slot and both standard models come with 16GB of internal memory. The card slot ensures that most will buy the 16GB editions – Sony hasn’t confirmed any other model for the Xpeia Z, either. The comparison of these two phones devolves closer to personal choice when it comes to custom user interfaces. The Samsung Galaxy S3 uses TouchWiz, and the Sony Xperia Z a newly-designed interface. It’s business as usual for Sony style-wise. That means a slick and serious look, not one that’s content to appear cute and friendly. It looks good, though, and its only ulterior motives are to direct you to Sony’s media services. That’s Sony Unlimited Music and Video, and the PlayStation store. The latter’s our favourite, giving to access to classic PS1 games. The Samsung Galaxy S3’s TouchWiz is a little jollier and more colourful-looking, and is more about packing-in as many additional features as it can. It’s Samsung’s favourite hobby. Extra bells and whistles include Smart Stay, using the front camera to see if you’re there and then stopping the phone going to standby if you are, and S Beam. This uses NFC to let you transfer files and info with compatible phones. From a specs perspective, the Sony Xperia Z hammers the Samsung Galaxy S3 once more. It has a 13-megapixel Sony sensor while the Samsung packs an 8-megapixel one. Its front camera is also better-specced, at 2.2MP against the Sammy’s 1.9MP model. Using the latest Android software and having a custom UI designed for it has also granted the Sony Xperia Z a bunch of useful video modes. Most interesting of the lot is HDR video. HDR is a mode that stitches-together two exposures to create images with loads of extra detail. We’re used to seeing HDR still modes in phones, but this is the first time we’ve seen it in video. And boy, are we impressed. We’ll be back with the full conclusion on whether the Sony Xperia Z is really better than the Samsung Galaxy S3 once we get one in to review. For now, let us know your thoughts. Would your trade-in an Galaxy S3 for an Xperia Z?